To win five Formula 1 world titles, as Lewis Hamilton has now done, is a phenomenal achievement. Winning one World Championship is what every young driver dreams about, but very few would understand the amount of hard work, dedication and outright skill that is involved to achieve it. I don’t know the feeling of winning an F1 title from first-hand experience, but I do know just how much hard work and dedication it took for me even to be on the grid, one of 20 elite drivers in the world. The demands on an F1 driver are intense. Firstly, to be physically super-fit. Secondly, to immerse yourself within the team, and understand what are very complex cars inside out – the controls and procedures, which change every year. And on top of that, there is so much demand for a driver’s time for PR activities and events. Particularly if you are Hamilton driving for a global brand like Mercedes. To judge the potential effects of these demands, you only have to look at Hamilton’s former team-mate Nico Rosberg. He was an excellent driver and he ran Hamilton fairly close while they were at Mercedes together. He won the title in 2016 – but to do so he had to up his game that year to a level he had never reached before, shutting out almost everything else in his life. Rosberg achieved it – with help from some Hamilton reliability woes – and promptly retired. It was all too much. He had achieved his boyhood dream, but burnt himself out in the process, and he didn’t have anything left in him to continue the fight. Rosberg’s retirement speaks volumes about the skill of Hamilton but also the resolve needed to keep going for that long and at that level of intensity. Having said that, Rosberg did probably have to put in slightly more effort than Hamilton, because Hamilton makes up extra performance with a pure natural ability that few in F1 history have ever possessed. There is no better demonstration of this than his skills in wet weather. For me, pace in the wet highlights pure driving skill, as it is reliant on the driver’s natural ability to find grip and feel the limit without the natural references you build up in the dry. Hamilton thrives in it, and has done throughout his career. Back in his debut season in 2007, at the Japanese Grand Prix – three races from the end of the season – the championship fight was coming to a close. Hamilton was neck and neck with team-mate Fernando Alonso, who is also one of the best of all time in my opinion. Conditions were atrociously wet at Fuji, but Hamilton won the race and Alonso, the reigning champion, crashed out. It was a big moment in the title race (although Ferrari’s Kimi Raikkonen would end up winning on a dramatic final day in Brazil). At the 2008 British Grand Prix at Silverstone, I was a fan watching trackside in the teeming rain. Hamilton was an absolute class apart. Again, conditions were terrible and everyone else was spinning left, right and centre. His title rival that season, Ferrari’s Felipe Massa, spun five times in the race, while Hamilton showed absolute dominance to win by over a minute, lapping everyone up to third place. In 2018, some of the season’s decisive moments have come in wet weather. Hamilton won the German Grand Prix from 14th on the grid after a rain shower, which caught out title rival Sebastian Vettel, who crashed out of the lead. Pole position in the rain in Hungary then set him up for a win on a track that Ferrari were looking stronger on. It was a critical 14-point swing in the title race just before summer break. Vettel is a world-class driver. He has won four titles himself and has been well on top of team-mate Raikkonen. But this year Hamilton has exposed his flaws, while driving flawlessly himself. Vettel had all the pressure and kept cracking. Major errors at the French, German, Italian, Japanese and US Grands Prix cost him. Hamilton was unflappable. Vettel could have won the title this year, given his turn of speed and the form of Ferrari. He and Hamilton started the season with four titles apiece, and nothing to choose between the cars. There was plenty to choose between the drivers once it all panned out. Hamilton would have won the championship in either car, with the form he has been in this season. Hamilton lives a celebrity lifestyle, often jetting off to the US often in between races. He is involved in the fashion and music worlds and hangs out with a plethora of A-listers. When things don’t go well, people are quick to question his commitment, but even with all the talent in the world you cannot win five world titles without absolute dedication to the sport. The question now is how much more can he achieve? 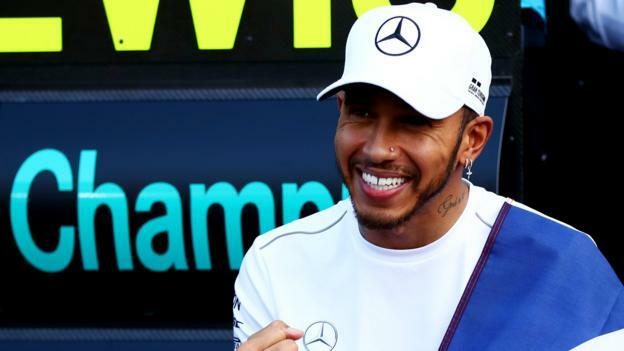 Hamilton signed a new two-year deal with Mercedes in the summer that will keep him there until at least the end of 2020, when there are likely to be major rule changes. Mercedes have been the dominant team since 2014, when turbo hybrid engines came in. Although Ferrari potentially had the best car for much of this season, it was pretty close on balance, and it would be a real surprise if Mercedes as a team were not able to mount a title challenge again next year, especially with Hamilton at the helm. Hamilton turns 34 in January. That is the sort of age at which drivers traditionally move towards the twilight of their careers. Alonso is retiring at the end of the season at 37 years old, and Jenson Button was 36 when he retired at the end of 2016. Raikkonen bucks that trend, though, and his move to Sauber next year means he will still be driving at 41. With Hamilton’s current form, it doesn’t look as though age is any problem for him. In 2018, he’s had his best year of his career to date. He’s been unbelievably quick, decisive in his overtaking, and has made so few mistakes. Whether he can get to Michael Schumacher’s record of seven world titles or even beyond will depend largely on his motivation, because his talent is unquestionable and his team are proven winners. Even more than that though, if Mercedes were to drop back for whatever reason, any other team would jump at the chance to sign Hamilton, because he can make the difference to a title-winning campaign as he’s proven this year. Who could challenge Hamilton in 2019? There are more challenges coming next year, though, and they were on brilliant display in Mexico on Sunday as well. Max Verstappen is the obvious one. In terms of outright speed, he might be the closest to Hamilton. His pace is ferocious, and if he can manage to consistently temper the aggression he showed earlier in the season, which too often got him in to trouble, then he could be a serious threat to Hamilton. Verstappen showed how dangerous he can be in Mexico, dominating the entire weekend, albeit pipped to pole by team-mate Daniel Ricciardo. It was about the only lap Ricciardo was quicker than Verstappen all weekend, but he did it when it counted most. Verstappen’s race was also exemplary, defending well against Hamilton at the first corner before showing very strong pace, tyre management and race management to cruise home to a comfortable win. The Red Bull car is his only obstacle to a championship bid for next year, particularly its engine. But with a switch from Renault to Honda next year, there is much optimism within the team. Honda have made great progress over the past few years and seem now to have a better engine than Renault. Potentially the most significant threat to Hamilton comes from the old enemy, though. Charles Leclerc joins Ferrari, replacing Raikkonen, and he possesses huge talent. His signing should force Vettel to find another gear for next year. Leclerc will be hungry for success and nipping at the heels of the established drivers immediately, as he seeks to make his mark. For Ferrari it’s exactly what they need if they are to topple Hamilton next year. A new, exciting driver to get in amongst the action. Leclerc’s rookie season has been super-impressive, including his drive to seventh on Sunday. If Leclerc can continue in that form then he can pressure Vettel, or maybe even mount a championship challenge himself if Ferrari can provide the two of them with a car at least as good as this one. So for now Hamilton can enjoy the success he has worked so hard for and absolutely deserved this season. But if he relaxes too much over the winter there are plenty of rivals who will be working unbelievably hard and would love to take his crown for 2019. Next articleHow can Gaza’s contaminated water catastrophe be solved?